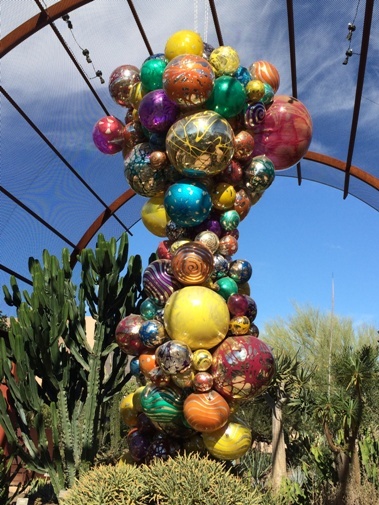 … to see Chihuly in the Garden for my annual winter trip to the Desert Botanical Garden with Deborah. 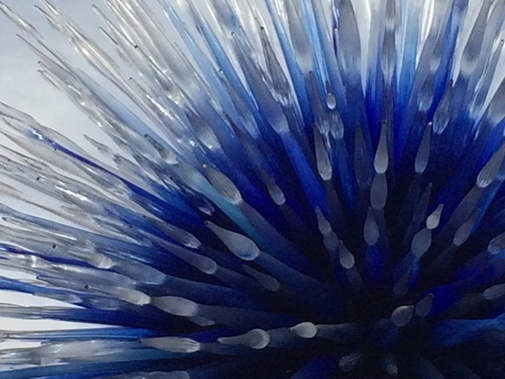 This photo is a closeup of Sapphire Star (2010) by artist Dale Chihuly, installed in 2013. As you pass through the entry gate, the first of many surprises greets you. 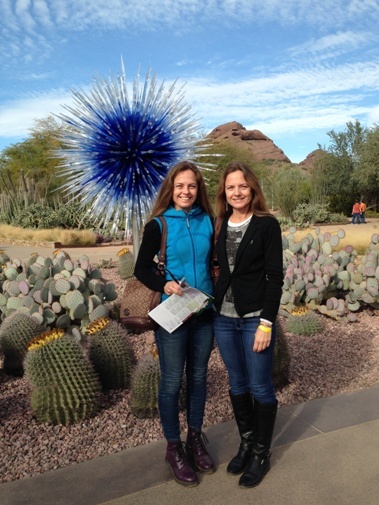 Here Chihuly’s Sapphire Star (2010) greets visitors. Installed in 2013, the exhibit runs until May 18, 2014. Let me just say it is spectacular. 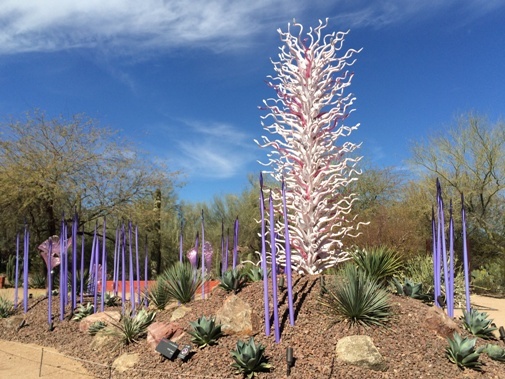 Blue Fiori Sun (2013) sits above a dry wall with Fouquieria splendens (ocotillo) in the background, left; and Euphorbia rigida (gopher plant) in the foreground, left. 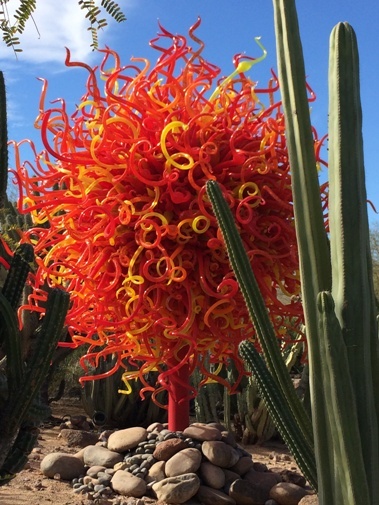 I didn’t get all the proper names of the Chihuly installations, but this one—and a few others—reminded Deb and I of Medusa. Red and yellow blown glass on a single tall post, two of which line the entry to the choice of trails beyond. I took a close-up of Chihuly’s Polyvitro Chandelier (2006) in the Succulent Gallery. Is it a skyscraper? No, it’s Chihuly’s Polyvitro Chandelier (2006). Even before we were standing next to it, I was laughing and wanted to have my picture taken with it (sorry, not included). 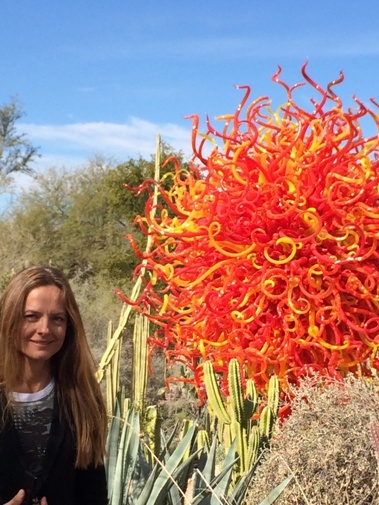 But I did get Deb to pose for me next to this beast—fantastic orange, red and yellow twisting blown glass attached to a red post, nestled in with the cactus and agave. There she blows! You gotta have some fun, right? 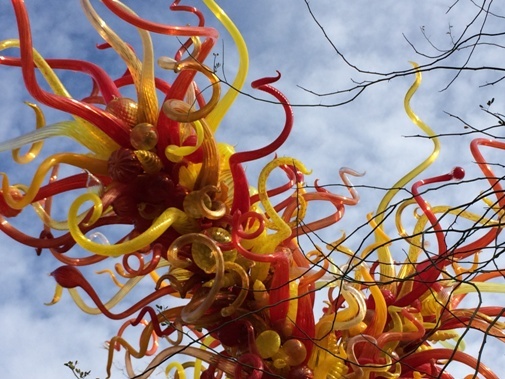 Whether you luv ’em or otherwise, all these creations by Chihuly made us laugh. And when I checked, everyone around us was having just as much fun with them. Isn’t that what vacations, and gardens, are for? 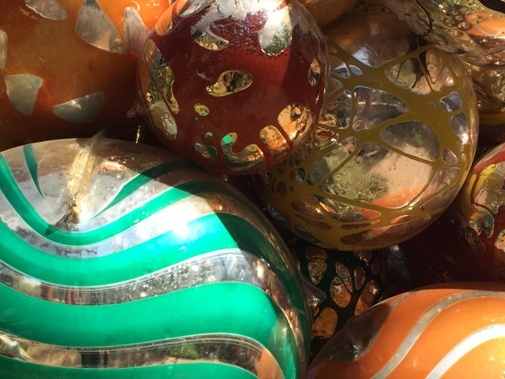 There are glass balls on the ground amongst the plants as well. 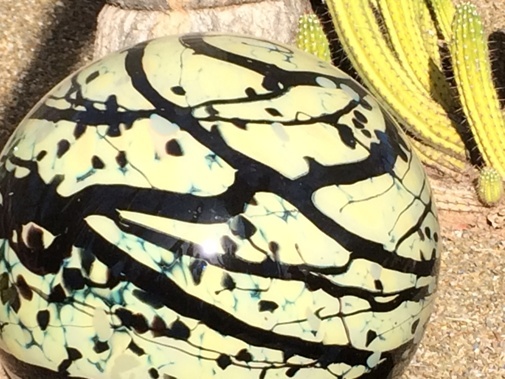 This yellow and black ball by Chihuly caught my eye. 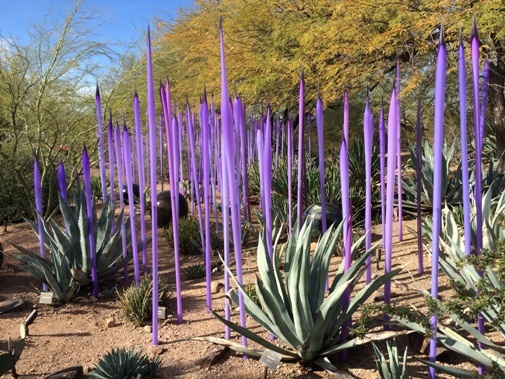 These tall slender spikes, or “reeds” as they’re called, are discovered throughout the garden in a multitude of colours, from purple to yellow, green, black and white and red. 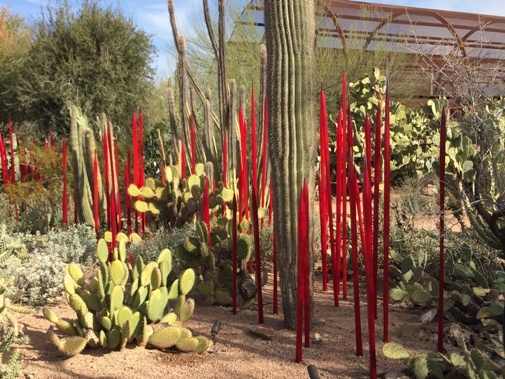 The red of Chihuly’s Red Reeds is especially vibrant amongst the opuntia and saguaro. …OK last one! Pink and white featured with reeds are all Chihuly. Forgive me for not knowing all the proper titles but wow! What a show. 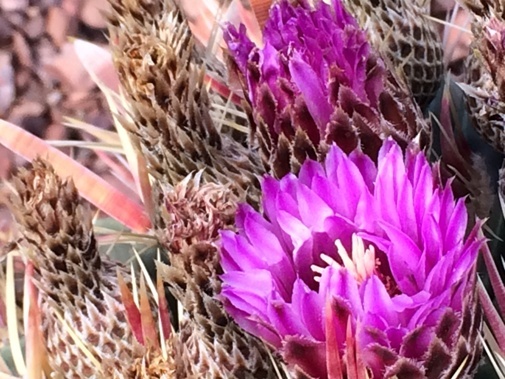 It’s been awhile since I’ve updated my blog, so how about some desert plants now? 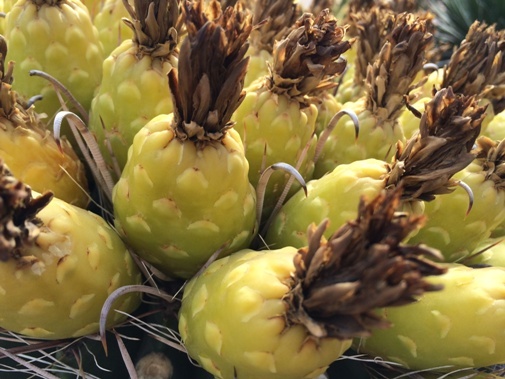 The fruit of this Ferocactus wislizeni (fishhook barrel cactus) were so beautiful I had to take a closeup. 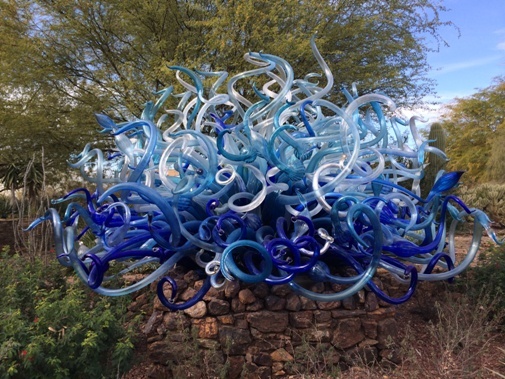 It’s located in the Entry Garden, near the Chihuly Sapphire Star (2010). 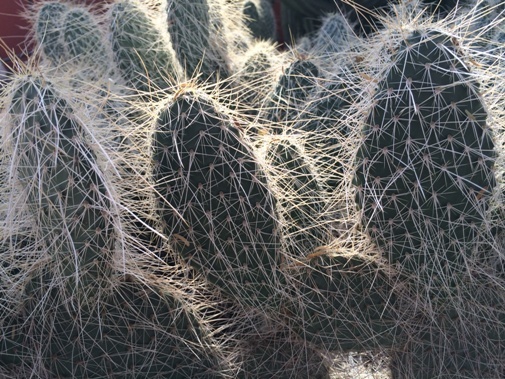 Ferocactus latispinus (Devil’s tongue) is a species of barrel cactus native to the southern United States and central Mexico. Opuntia basilaris (Beavertail pricklypear) is native to the southwest United States. 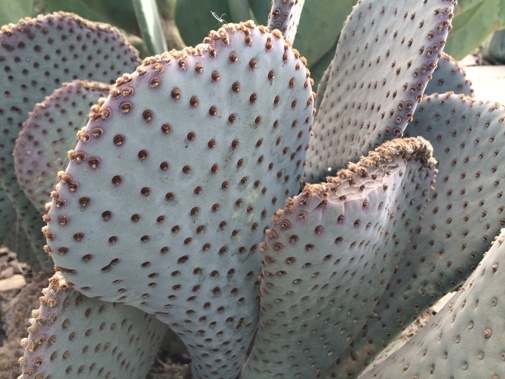 It almost puts our native-Ontario opuntia to shame, almost. Opuntia polyacantha var. erinaceae (Grizzly bear pricklypear) has long flowing spines, which sometimes completely cover the flat, medium-sized pads. Opuntia engelmannii var. 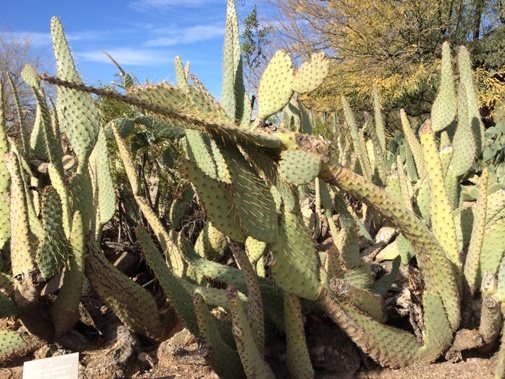 linguiformis (Cow tongue pricklypear) is critically imperilled in its native range, as noted on the Desert Botanical Garden’s label for this cactus. 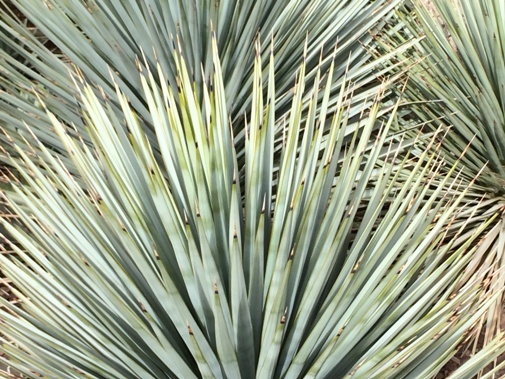 Yucca rigida (Blue yucca) is tree-like with long blue-grey blades. Stunning. 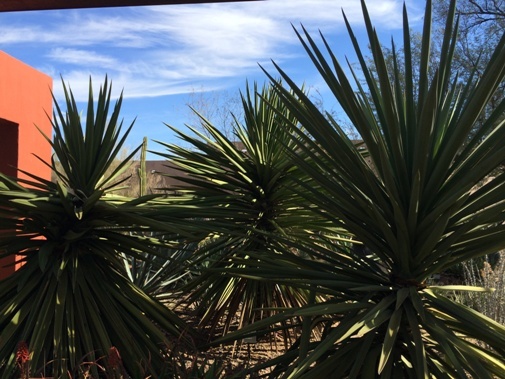 Last time I visited the Desert Botanical Garden, these three Yucca faxoniana (Faxon yucca) were sporting spectacular flower spikes. 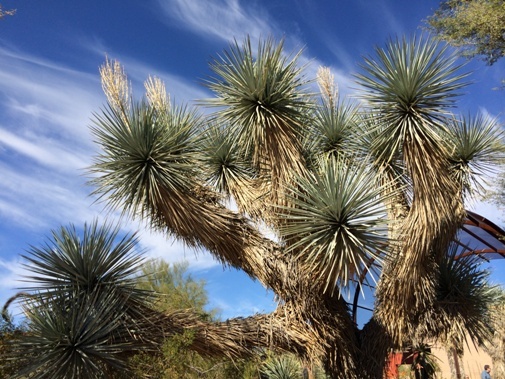 This Yucca elata (soaptree yucca) was reaching up into that bright blue sky that followed me everywhere in the low desert. The weather was as warm (hot some days) there as it was cold here. I might add, though, that it was easily a minimum of six degrees centigrade above average winter temperatures. Stay tuned for agaves next week. 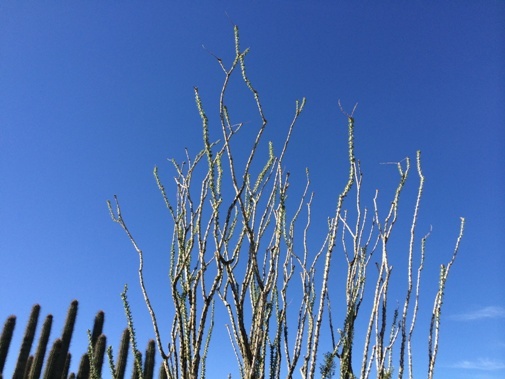 Fouquieria splendens (Ocotillo) reaching for that blue sky. 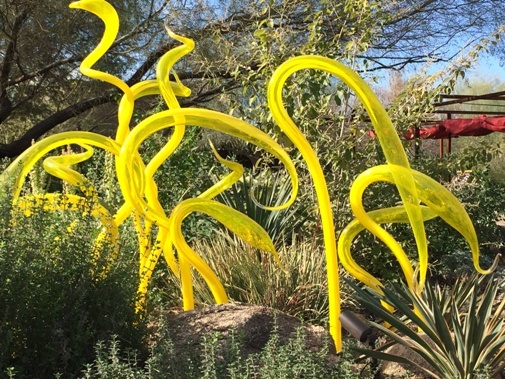 Dale Chihuly is represented by Sandra Ainsley Gallery. Sandra Ainsley Gallery is based in Toronto, and is the leading contemporary glass art gallery in Canada.